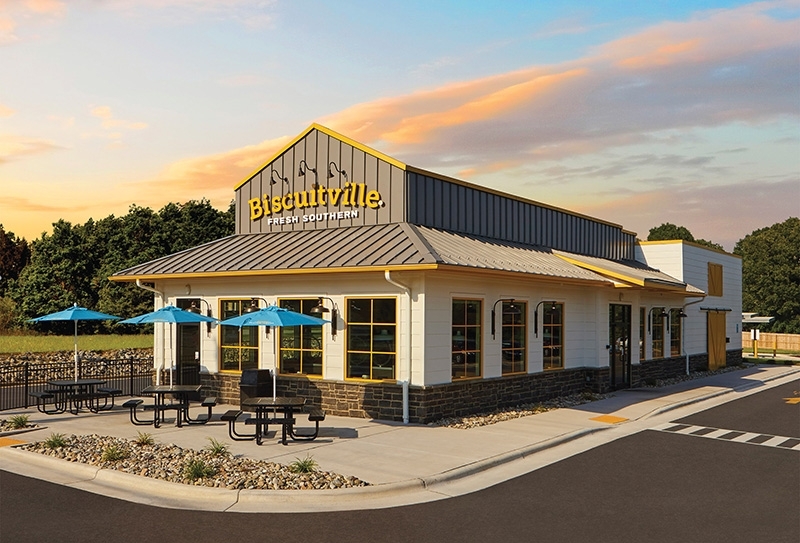 With a rise in remodels and new Southern markets under development, North Carolina-based Biscuitville bets on new business with a fresh new look. FRESH SOUTHERN® is the catchy new brand theme for Greensboro, North Carolina-based Biscuitville, which currently operates 55 fast-casual restaurants in North Carolina and Virginia. 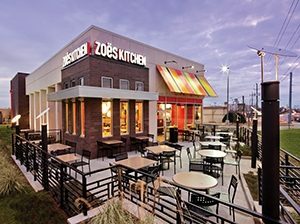 Of course, it refers to the food — savory, Southern, fresh-baked fare — but it could just as well refer to the brand’s recent remodel: a fresh, clean look with authentic, Southern-inspired accents. From the biscuits to the branding, Biscuitville sure has some good stuff cooking. In 2014, Biscuitville FRESH SOUTHERN® began a major rebranding effort to position the company for growth. The refresh included an updated logo and the inclusion of FRESH SOUTHERN® to the brand name that better reflected its commitment to sourcing from regional, family-owned businesses and buying local ingredients when possible. A new prototype was unveiled and modified based on consumer feedback. 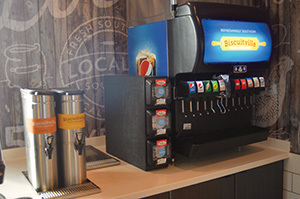 After several consumer-led modifications, the updated prototype is now being rolled out in all of Biscuitville’s new and remodeled locations. Next, the 52-year-old company doubled down on locally sourced ingredients, Southern hospitality and added new menu items, including a Pimento cheese and bacon biscuit, spicy chicken and honey biscuit, and waffle sandwiches — all of which include locally sourced ingredients. “Over 90% of all Biscuitville orders include a locally sourced ingredient,” Niven says. These may include custom-milled flour from Henderson, North Carolina; country ham cured in Wilkesboro, North Carolina; coffee from Concord, North Carolina; eggs from western North Carolina; all-natural chicken from Mt. Airy, Georgia; and pickles from Mt. Olive, North Carolina. 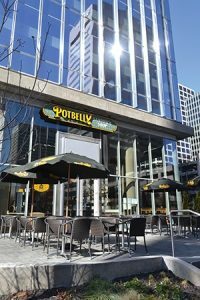 All new restaurants, remodeled locations and new menu items are built on the family-owned company’s foundation of serving fresh, scratch-made food using local ingredients. During the last 3 years, the company has remodeled dozens of existing locations. 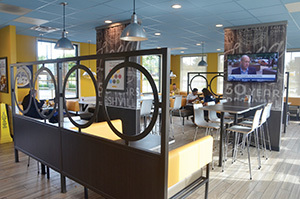 More recently, from 2017-2018, Biscuitville opened two new restaurants, completed two scrape-and-rebuilds, and completed two relocations. The company plans to have all 55 locations refreshed to the new look by 2021. New design elements include an exterior façade resembling a reclaimed Southern barn, with a tin roof, barn doors and gooseneck lights — warm and traditional, but with a modern twist. All exterior lighting was modernized to LED this year, including pylon signs. Interior features combine a modern look and feel with Southern heritage through industrial hardware, blue painted ceilings inspired by Southern porches, and mixed materials like wood, metal and tile. Large photos and artwork capture scenes of the local neighborhood and community. Also part of the 2,900-square-foot space is new custom seating, custom wallpaper, an enhanced beverage area with expanded drink options, including an iconic Southern soft drink, Salisbury, North Carolina-based Cheerwine®. Added conveniences include free Wi-Fi, electrical access for devices and large-screen TVs. According to Niven, consumers have been very responsive to the clean, fresh design. 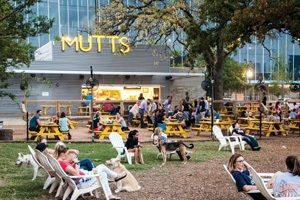 They like the open kitchen and elevated biscuit-making theater, which allows guests to view the biscuit-making process, as well as the varied seating options — from tall tables with charging stations to community-style seating. 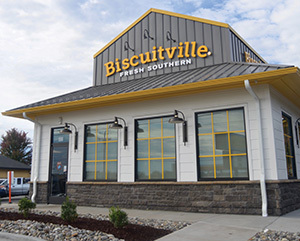 In September, Biscuitville revealed plans to enter its first new market in a decade with an entry into Fayetteville, North Carolina, with two restaurants to open mid-year 2019 followed by two more later next year. In 2020, the company plans four additional locations in Raleigh and Fayetteville. 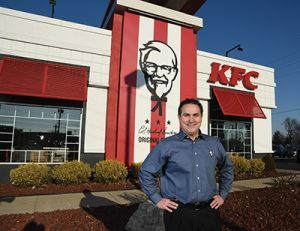 The first Fayetteville-area restaurant will open in late spring 2019 in Spout Springs, and the second will open mid-summer in Grove Street. To follow will be another in Hope Mills, along with one in Reidsville, North Carolina. “Currently, we’re focused on our current designated market areas (DMAs) — Raleigh, Charlotte, Roanoke [Virginia] and the Triad [Greensboro, Winston-Salem and High Point, North Carolina] — but we’re keeping our options open for potential new markets,” Niven notes. “Our vision is to expand regionally but we have plenty of work to do in North Carolina and Virginia in the short term. 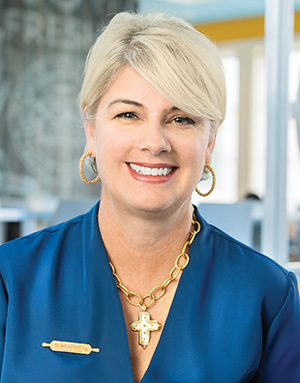 Biscuitville plans to grow restaurant count at a rate of 8% to 10% per year, growing the brand to approximately 150 restaurants within the region by 2030. “We are concentrating on our heritage markets first and moving out approximately 200 miles through 2023, which allows us to continue self-distribution,” Niven explains. Biscuitville owns and operates its own supply chain, warehousing and distribution systems. 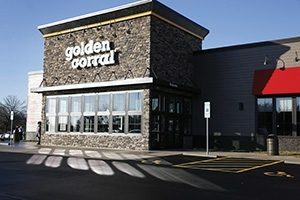 Currently, Biscuitville posts a system average of nearly $1.5 million in annual restaurant sales volumes — despite the fact that its restaurants close every day at 2:00pm — with its highest volume restaurants at nearly $2.5 million per year. Niven says 100% of Biscuitville operations will be using a new speed of service tool by the end of the year. It allows employees the immediate intelligence they need to eliminate thruput bottlenecks in real time. Constant identification of bottlenecks is critical to immediately correcting minute-by-minute service delays. The company also started utilizing drive-thru tablets in 2018 and will have those rolled out to the system by the end of 2019. — This article originally appeared as the cover story of Retail & Restaurant Facility Business magazine’s November 2018 issue. Email the editor at katie@francemediainc.com.